The idea of new dedicated taxes to fund Metro is getting support from an analysis done by a conservative think tank, buoying supporters’ hopes that the idea could overcome significant regional hurdles. WASHINGTON — The idea of new dedicated taxes to fund Metro is getting support from an analysis done by a conservative think tank, buoying supporters’ hopes that the idea could overcome significant regional hurdles. American Action Forum data analyst Philip Rossetti suggests that current funding, done through a variety of taxes across the region including some gas tax revenue and general tax dollars, is too broadly based. “If you have dedicated funding, and the sources are going to fluctuate with the system usage, then that would definitely be a lot better than the system we have now,” he said. D.C. Councilmember and Metro Board Chair Jack Evans, business groups in the District and others have stepped up a push for dedicated funding for Metro over the past year or so as an addition to existing funding levels, not as a replacement. They have acknowledged it is an uphill battle, especially given that the heavily Republican Virginia House of Delegates would have to sign off on any agreement. Supporters of the dedicated tax point to the huge benefits for the region that comes from increased development and economic activity around Metro stations and fewer cars on the road. 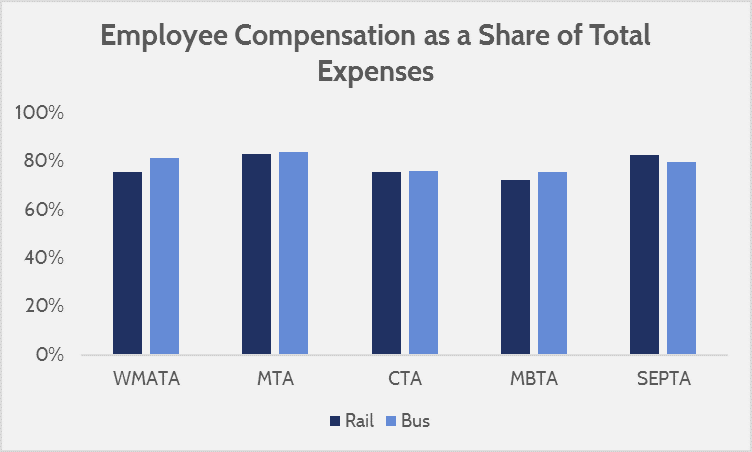 The new analysis, based on the most recent National Transit Database, suggests that Metro’s cost per rider in 2015 was higher than similar transit systems in New York, Chicago, Boston and Philadelphia, but that the overall distribution of costs, across worker salaries and benefits and other operations, was in line with those other systems. Rossetti provided the analysis to WTOP ahead of its public release. Metro also covered a relatively high portion of its rail costs through rider fares compared with other systems. “This is an expensive system, but it … is not necessarily using its funds in a very irresponsible way. The challenges that WMATA faces are going to be systemic, and it’s going to be a long process in fixing them, and it’s not something that any one budget in one year can address,” Rossetti said. The details have changed somewhat since 2015, including continuing declines in ridership due to track work and delays. The Metro Board is set to vote next week to cut scheduled rush-hour rail service this summer and, for the first time in three years, raise fares across the board. Between special federal capital funding and local matches added for safety fixes after the deadly 2009 Red Line crash, Metro had slightly more total approved combined capital and operating spending per person living in the region served in 2015 than New York’s MTA or Boston’s MBTA. Metro did not actually spend most of its capital budget that year, and an analysis prepared for the Metro Board last summer found the agency spent 24 percent less than similar transit agencies on rail capital improvements between 2003 and 2013. Because the proportions of spending on worker salaries and other costs are similar to other agencies, Rossetti concludes Metro needs better incentives that would lead to more funding as the system provides better service. 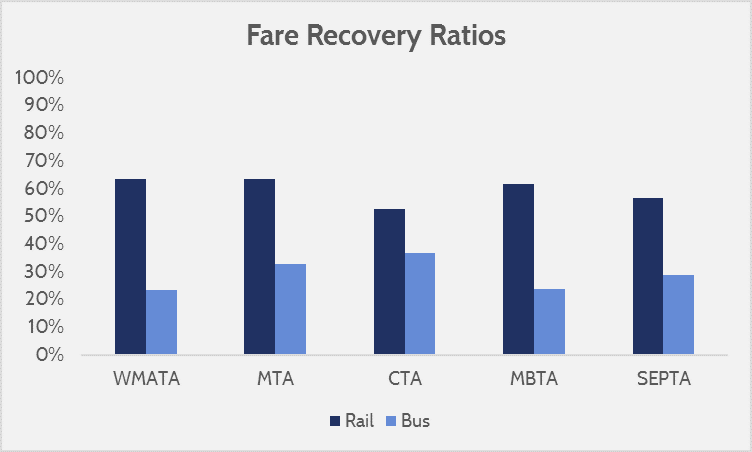 “The fare recovery ratios and the actual expenditures don’t seem to be terribly different compared to other transit agencies. “We’re not spending any more on our personnel or our equipment compared to other organizations, yet somehow everything seems to be a little more expensive on the bottom line,” Rossetti said. Any increase in funding or dedicated tax structure has so far faced stiff opposition in Annapolis and Richmond, but support from an analysis published by a group such as the American Action Forum could trigger at least some movement. The think tank’s leader is one of the few, for example, to publicly support U.S. House Republicans’ controversial health care plans. “It could be something like a commission which is going to give recommendations to the states on what sort of tax to levy and how to use those taxes,” Rossetti said. He suggests the tax changes should coincide with clear measures of Metro’s success. “There needs to be some sort of unification among them, and some sort of clarity and dedication for the funding,” he said. Rossetti usually works on energy policy, but said he was motivated as a frustrated rail rider to look at data about Metro. His other recommendations include massive cuts, or a significant fare increase, to bus service. Metro is set to significantly raise bus fares this summer, but the region and the Metro Board roundly rejected widespread bus service cuts in the current budget cycle in order to avoid cutting off thousands of people from jobs and access to other parts of the area.